Remote work is where it’s at. More and more companies have at least some components of their business based out of the traditional office. Startups in particular rely heavily on scattered employees and freelancers. So, who needs the traditional, kitchen sink job board when the workforce and employers are hungry to go remote? Landing remote jobs and working in isolation present unique challenges, as those with plenty of experience working remotely know well. High time a startup speak directly to the needs of this rapidly growing community. Subscribe to the newsletter at remotive.io and browse curated, remote jobs at jobs.remotive.io. We have lots of good reasons to love podcasts – great content on a wide variety of subjects, bold Internet personalities, the intimacy of interviews with unfiltered commentary. And we have one very good reason to dislike podcasts – uneven audio quality. It goes without saying that not all podcasts have the studio capabilities of This American Life. Which is fine. Pity though when interviews conducted on Skype or on the phone sound incomprehensible. 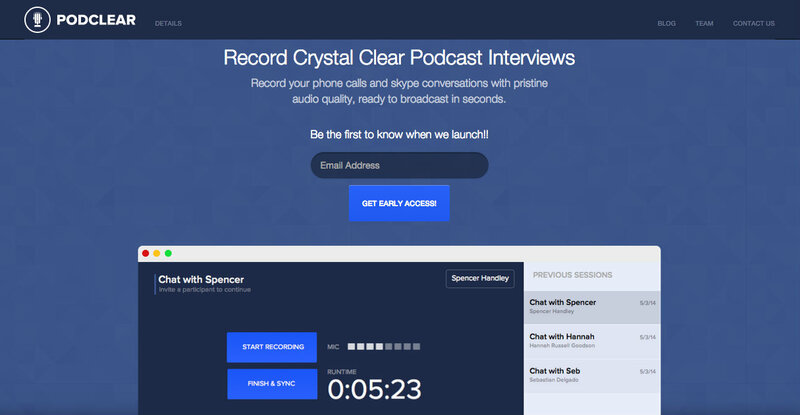 The PodClear application lets podcasters record crystal clear interviews. No need to change the chat service you’re already using or your recording rig. PodClear runs in parallel, allowing you to work as you like, adding only the simple press of a button. PodClear records separate tracks of each party as well as a mixed version, which makes both editing and broadcasting fast and easy. Podcasters can also use the service to store their podcasts. Looking to record pristine interviews and ratchet up the quality of your podcasts? Sign up for early access at podclear.com.